Indian domestic air traffic for May 2015 was up by 18.35%, with IndiGo leading the domestic air passengers market. The scheduled domestic airlines carried a total of 71.27 lakhs (7.27 Mn) of domestic passengers during the month, according to DGCA released data. This was up by 18.35% from May 2014 and 8.66% up from 65.59 Lakhs (6.56 Mn) domestics passengers in April 2015. The period of January to May 2015 saw 322.32 Lakhs (32.23 Mn) domestic passengers flying as compared to 267.22 lakhs (26.72 Mn) passengers flying during the same period in 2014. Air India&apos;s market share dropped to 15.83% in May 2015 with the airline carrying 11.28 lakhs (1.19 Mn) passengers during the month, which was more than the 10.65 lakhs (1.06 Mn) passengers it carried in April 2014. The number of passengers flying with the nine private carriers were 59.93 Lakhs (5.99 Mn) for the month. These private carriers thus increased their market share to 84.16%. 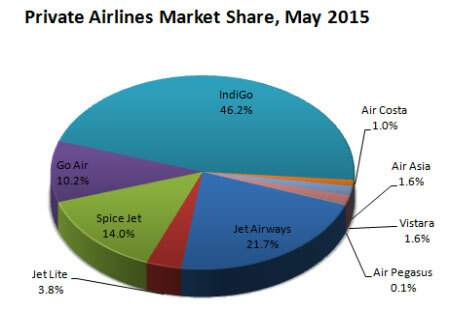 IndiGo was the leading airline in the domestic air traffic market with 38.85% market share in May 2015. The airline carried 27.69 lakhs (2.77 Mn) passengers during the month. Jet Airways maintained a distant number two position with 18.25% market share and flying 13.01 Lakhs (1.30 Mn) passengers. Air India maintained its third position with 15.83% share, while Spice Jet continued to increase its market share to 11.74% carrying 8.37 Lakhs (0.84 Mn) passengers. Number of passengers flying with GoAir were 6.13 Lakhs (0.61 Mn) keeping the airline at fourth position with 8.60% passenger during May 2015. 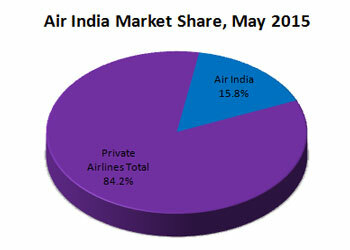 The top five players cornered 93.28% of the total domestic air passengers market in India. Jet Lite flew 2.25 Lakhs passengers taking 3.16% market share, with Air Asia taking a 1.32% share with 0.94 lakhs passengers. 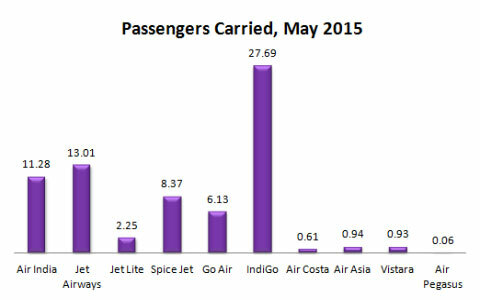 Vistara was at 8th position carrying 0.93 lakhs passengers with a market share of 1.2%. Air Costa with 0.86% market share carried 0.61 lakhs passengers. The new entrant Air Pegasus airlines, at 10th position carrying 0.06 Lakhs passengers. The competitive space of private carriers became little more crowded with the entry of Air Pegasus, however IndiGo continued leading at the top with an increasing market share of 46.20%. Jet Airways had a market share of 21.71% at second place. 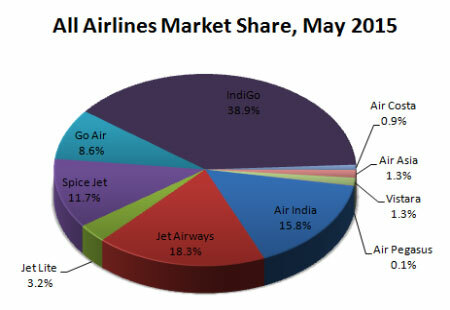 Spice Jet was at third position with 13.97% share while Go Air maintained its fourth position with 10.23% market share. The total market share of the top four airlines in the private carriers market was 92.11%. Jet Lite was a distant fifth player with 3.75% share. The rest four players Air Asia, Vistara, Air Costa and Air Pegasus respectively secured 1.57%, 1.55%, 1.02% and 0.10% of market shares.